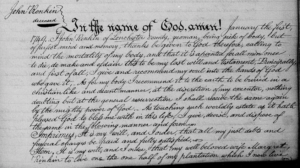 My most recent post (yesterday, July 18, 2018) contained a one-sentence summary of the 1749 will of John Rankin of Lancaster Co., PA. The original post had an error about the will, so I feel compelled to correct it … and add a bit to it. This post will contain images of John’s original will, an abstract, and a start of a chart for his family. As always, the facts are accompanied by opinion and commentary (or, as one relative described it, highly opinionated commentary). Given that my reference to John Rankin’s will arose in the context of a post of the Mt. Horeb tablet in Jefferson Co, TN, we will focus on what we know about John’s son Thomas, rather than Thomas’s brother Richard or any of his eight sisters. Thomas was the patriarch of the Mt. Horeb/Jefferson Co., TN Rankins. A disclaimer: all of this is conventional wisdom, so this post doesn’t add one iota to the accumulated knowledge of this Rankin family. All it does is add a tiny bit of evidence here and there for those who like that kind of foolishness. Here are images of John Rankin’s original will — in case you really love these old documents. These are screenshots from an online image of the original. That image is available at FamilySearch.org. at this link. You may need an account at the Family History Library to view it, but accounts are free and very worthwhile. The original will, dated 1 Jan 1749 and proved 25 Feb 1749/50, is recorded in Lancaster Co, PA Will Book J at page 211. It is the absolute dickens to find online, since the people who photographed these documents apparently didn’t give a whit about making sure page numbers were clearly photographed. John named his wife Margaret. Conventional Rankin wisdom identifies John’s wife as Jane McElwee. I don’t know how the conventional wisdom reconciles the name Jane with the will. Some people claim her name was Margaret Jane McElwee, although that runs counter to the fact that virtually no one of that era had a middle name. That approach seems a real cop-out. I would call her Margaret, period. Anyone have any record evidence of her maiden name, I hope? They were reportedly married in Ireland, where I have done no research. John named his two sons Richard and Thomas. Richard inherited his father’s clothes. Thomas inherited half of the plantation immediately and the other half at his mother’s death. Reading between the lines, Margaret was Thomas’s mother. John identified six of his daughters as Elizabeth, Ann, Margaret, Catrin, Rebecca and Agness. He also named two sons-in-law — William White and John Waugh, although he didn’t mention the given names of their wives. Interestingly, one of John’s grandsons — John, a son of John and Margaret’s son Thomas Rankin — married a Waugh in Pennsylvania. Perhaps she was his cousin? More on him in another post. Son Richard and wife Margaret were executors. Witnesses were James Crokett (sic, Crockett), Richard Rankin, and Jane Steel. First time I’ve ever seen a beneficiary witness a will. These days, and most days, that is/was a no-no. I haven’t tracked any of John and Margaret’s daughters, although that’s on my Rankin to-do list. As for the sons, Richard (says the Mt. Horeb tablet, reproduced in yesterday’s post), went to Augusta Co., VA. So, apparently, did Thomas, at least for a time. First, there is a deed dated 20 Nov 1779 (Cumberland Co., PA Deed Book E-1: 511), from Thomas and Isabel Rankin of Cumberland Co., PA to John Rankin of same … 100 acres in Fermanagh Township on the north side of the Juanita River. The deed is signed by Thomas Rankin and Isabel (her mark) Rankin. In light of multiple family oral history traditions that Thomas (son of John Rankin d. 1749) married Isabel Clendennon/Clendenin — plus recurring names in the line — there is little doubt that this was Thomas, son of John. Also, the grantee John Rankin was probably the John Rankin who remained in PA at least long enough to marry either Martha or Jane Waugh and have a couple of sons before moving to TN. William Rankin, wife Sarah, PA and VA line. Born 27 Jan 1759 “some 5 miles below Carlisle in Cumberland Co., PA” and he lived at Juniata in that county at enlistment. In Jun 1780 he moved with his father to Augusta County, VA and also enlisted there. Soldier married Sarah Moore 29 Aug 1787 in Greene Co., TN and she was b. Jul 1763. Soldier d. 13 Dec 1833, widow applied 25 Mar 1844 in Green Co., TN. Children were (1) Thomas b. 13 Jul 1788, (2) Peggy b. 1 Jan 1790, (3) John Moore Rankin b. 10 Apr 1792, (4) Anthony b. 23 Aug 1794 (see Greene Co. TN records for Anthony) (5), Isabel Clindinon Rankin b. 30 Aug 1796, (6) William b. 23 Mar 1799, (7) Ginny b. 17 Nov 1801 and (8) David b. 10 Feb 1804. Note that the Mt. Horeb tablet identifies Thomas and Isabel Clendennon Rankin’s son William as having married Sarah Moore. So … the pension application gives us a nice link between the Rankins of Cumberland and the Rankins of Greene/Jefferson. 1 John Rankin b. unknown, d. 1749, Lancaster Co., PA. Wife Margaret. 2 Eight daughters. I apologize for giving them short shrift here. 2 Richard Rankin, to Augusta Co., VA.
2 Thomas Rankin, m. Isabel or Isabella Clendennon/Clendinnin, Cumberland Co, PA to Augusta Co., VA to East TN (Greene/Jefferson counties). 3 William Rankin, b. 27 Jan 1759, Carlisle, Cumberland Co., PA, to Augusta Co., VA in 1780, then to Greene Co, TN by 1787. Wife Sarah Moore. This extraordinary family has a history that is, for the most part, very easy to trace. Some of it is inspiring, some heartbreaking, such as the descendant of John and Margaret Rankin whose family perished (or at least half of then did) in the 1918 flu epidemic. Stay tuned. If you don’t wind up loving this East Tennessee family, I will not have done my job. And I’m not even descended from them (although we clearly share YDNA). What is “proof” of family history? I’m going to divert briefly from my research slog through various Rankin families of Pennsylvania, Tennessee, Kentucky, and Ohio long enough to address this issue: what constitutes genealogical proof and what does not. I have a distant cousin (seventh cousins, maybe?) named Roberta Estes. We “met” online via Estes research some twenty years ago. We finally met in person, spending a week together in Halifax County, VA doing nitty-gritty research among records in the basement of the Halifax courthouse. I knew I had found a kindred spirit when I learned she likes tax and deed records as much as I do. Roberta writes an excellent blog called “DNA Explained.” A great many of her posts are about DNA “science.” When I have a question about DNA, the first place I go is to her blog and search her Archives. Roberta’s post today is on a topic that will interest all family history researchers: what is, and what is NOT, genealogical proof. Here is a link to her post. Proof is not an oral history, no matter how much you want to believe it or who said it. Oral history is a good starting point, not an end point. Proof is not, not, 1000 times NOT someone else’s tree. A tree should be considered a hint, nothing more. Proof is not a book without corresponding evidence that can be independently corroborated. Being in print does not make it so. People make mistakes and new information surfaces. Unfortunately, there are also genealogical frauds – see, e.g., Gustave Anjou. Proof is not a man by the name of Jr. [taken to mean] that he is the son of a man by the same name with the suffix of Sr. “Sr.” often means older and “Jr.” means younger, but not necessarily related. In fact, the suffix can change over time for the SAME MAN: a Robert Rankin who initially showed up in Guilford, NC records as “Robert JUNIOR.” became “Robert SENIOR” after Robert the elder (his father) died. Proof of a father/son relationship is not just two men with the same name in the same location. Proof is not just a will or other document … without evidence that a person by the same name as the child named in the will is the RIGHT person. The lawyer in me, retired though she might be, feels compelled to expand on Roberta’s discussion of “proof.” Namely, I want to draw a distinction between “proof” and “evidence,” and the amount of evidence that is needed to produce a certain standard of proof. The definition of “evidence” takes up a full page in Black’s Law Dictionary. Fortunately, the essence of the meaning of “evidence” as it relates to genealogical research is pretty easy to distill. Try this on for size: EVIDENCE is anything that is offered to prove the existence or nonexistence of a fact. In genealogy, evidence might be a deed, a will, tax records, church birth and death records, census records, tombstone inscriptions, and so on. Notice that the word “prove” appears in that definition. Here is what Black’s has to say about that: PROOF is the effect of evidence. Boiling both definitions down, evidence is what supports a belief that a fact is proved (or disproved). Beyond a reasonable doubt: at least 95% of the facts compel a certain conclusion. Great weight and preponderance: about 65-85% of the evidence supports a conclusion. Preponderance of the evidence: a conclusion is more likely than not – it has the weight of 51% of the evidence. Naturally, there are parallels in family history research, or I wouldn’t be talking about this. You frequently see the phrase “conclusively proved” in family history articles. This is roughly equivalent to “beyond a reasonable doubt.” For example, my paternal grandmother’s identity – Emma Brodnax Rankin – is conclusively proved by my birth certificate, my father’s birth certificate, his mother’s will naming him as a son, census records naming him as a son, ad infinitum. Not to mention my recollection of all those awful holiday dinners in her grotesquely overheated house in Gibsland, Bienville Parish, Louisiana. A court would call my testimony about those dinners “direct evidence” based on personal knowledge. If I’m a credible witness, THAT case is closed. When you see the phrase “conclusively proved,” it means there is really no reasonable argument to the contrary. That is how I use the phrase on this blog. Use of the word “probably” in family history articles seems to equate with “preponderance of the evidence.” Namely, a conclusion is more likely than not. Similarly, the phrases “most likely” or “almost certainly” are somewhere in between the other two. There may be a reasonable doubt, but the weight of the credible evidence strongly points one way. We also need to talk about“circumstantial” evidence, because sometimes there is no other proof of a family relationship. That is particularly true in counties where records have been lost and documentary evidence is limited. “Circumstantial evidence” just means facts that lead to a reasonable inference. For example, the fact that a 65-year old man named Jedediah Rankin is listed in the 1860 census in a household immediately adjacent to 40-year old Jacob Rankin constitutes circumstantial evidence of a relationship. You can reasonably infer some family connection between the two men because such an inference accords with common sense and experience. If Jacob and Jedediah witness each other’s deeds, that would provide additional circumstantial evidence of a family relationship. If Jacob named his eldest son Jedediah, and Jedediah Sr. was security on Jacob’s marriage bond, those facts would also be circumstantial evidence. Circumstantial evidence can establish a compelling web of family connections which suggest that only one conclusion seems reasonable: Jacob was Jedediah’s son. It is a powerful tool in serious research. Now, back to Roberta’s list of “not proof,” item #2, someone else’s tree. It may be a fact that “many online trees” show Jedediah as Jacob’s father. That is not even evidence of a relationship between those two men. All it might prove is that many online trees are copies of other online family trees. Finally, Roberta’s item #1, family oral history, is near and dear to my heart right now. Family legends/family oral traditions nearly always reveal important truths. They usually also contain errors. And we’ll begin my next post with what is probably the most well-known and firmly established oral tradition in Rankin family history. Author Robin WillisPosted on July 11, 2018 July 12, 2018 Categories MiscellaneousTags genealogical research, proof9 Comments on What is “proof” of family history? Subsequent to the original posting of this article, significant new information came to my attention requiring a substantial rewrite. I have deleted the original and post this revised version in order to clear the record of incorrect information. During the 18thand 19thcenturies, several Willis families on the Eastern Shore of Maryland were Quakers. I have long believed that the John Willis family who lived on land called Wantage in Dorchester County was not one of them.The evidence I had found to date supported that conclusion. For example, Wantage John’s eldest son John, Jr. lived on Marshy Creek in what became Caroline County. Several Quaker Meetings and the Anglican St. Mary’s White Chapel Parish served the region. The Anglican records do not survive, so whether John Jr.’s family attended there is lost to history. On the other hand, numerous Quaker Meeting records of the period exist. John, Jr.’s family does not appear in any of them. Apparently, the family was not Quaker. The record for Wantage John’s son Andrew is more straightforward. Andrew lived in Dorchester County. Three of his four sons appear in the records of Old Trinity Church near Church Creek at the baptism of several children between 1754 and 1775.No Quaker record names any of these people. This family was clearly Anglican and not Quaker. The elder John had two other sons, Thomas and William. Thomas lived adjacent John Jr. on Marshy Creek. William inherited Wantage from his father and lived there until moving close to his wife’s family on Hodson’s/Hudson’s Creek in the Neck Region of Dorchester County. Neither of these sons appears in any religious record, Anglican or otherwise. Therefore, no evidence suggests a connection to Quakerism for anyone in the Wantage John family for the first couple of generations. And, there is evidence that one family group was Anglican. Beyond these first generations, descendants of John of Wantage and related families were prominent in Methodism. Barratt’s Chapel in neighboring Kent County, Delaware was the birthplace of Methodism in America.Lydia Barratt, granddaughter of Philip Barratt who built the chapel in 1780 is the great grandmother of Henry Fisher Willis, a direct descendant of Wantage John. Henry was a significant supporter of the Bethesda Methodist Church in Preston, Caroline County, Maryland, with a stained glass window honoring his service in the late 1800s. Henry’s father Zachariah Willis was a trustee of the Methodist Church whose twin brother Foster gave land for a church in 1831. I concluded from this data it highly unlikely that any of Wantage John’s descendants belonged to the Society of Friends. In fact, I used membership in the Society as a screening tool to eliminate various Willis lineages as being related to John of Wantage. For example, there is a Quaker Willis line in eastern Dorchester County and in the Federalsburg region of Caroline County.Another Willis line in Talbot and Caroline County attended the Tuckahoe Monthly Meeting. Indeed, many researchers have conflated a Richard Willis in that line, who married Margaret Cox, with a Richard Willis in Wantage John’s line. A third line of Willises who lived in Kent County, Maryland were also Quaker. None of these families are related to John Willis of Wantage at least on this side of the pond. The listed parents Richard Willis and Britanna (Britannia Goutee) are well known to me, but I had no inkling they were Quakers. Richard, born 8 Aug 1759, is the son of Richard Willis, died 1764, and the great grandson of John of Wantage. Richard and Britannia, born about 1765, married in Caroline County on 22 Jan 1788.She is descended from John Gootee and Margaret Besson/Beeson, who came to the colony from France with Margaret’s father and became naturalized citizens in 1671.So, have I been wrong all along about this Willis line and Quakerism? Well, I don’t know. Certainly, I was wrong about Richard and Britannia, however, these seem to be the only Quaker records online for the family … no marriages, no grandchildren’s births, no deaths recorded after Britannia’s in 1826. This particular record does reveal some other information. First, the record is handwritten … an Index plus a section of Births and one of Burials. However, the cover page is typewritten, stating that it is from the Wilmington Monthly Meeting.An examination of the contents reveals, however, that the cover page is incorrect. The record is actually from the Northwest Fork Meeting in Federalsburg based on the following. For one thing, the record noted that two of the listed people were “Elders in the NW Fork Monthly Meeting.” Additionally, surnames in the record, such as, Charles, Dawson, Kelley, Leverton, Noble, and Wright, are of Quaker families known to have lived near the Northwest Fork of the Nanticoke River. Finally, the record indicates the residence of a few of the listed persons. The record mentions only three counties: Caroline and Dorchester, Maryland, and Sussex, Delaware. Federalsburg is located at the intersection of those counties. Clearly, the record is from that Meeting and not Wilmington. The second thing apparent from this register is that it is a copy and not the original register. The handwriting is identical throughout, both in the index and the birth and death entries. Had the entries been made at the times the events occurred from 1790 to 1828, the person making the entries surely would have changed from time to time. Therefore, the handwriting would have varied. Furthermore, many entries relating to a single family are grouped together regardless of date. For example, all the Willis birth entries are on a single page.The same is true of some other families. One would expect the original register to be in chronological order with the family names mixed together. Apparently, a clerk prepared a copy of the original register, reorganized and indexed it. Likely, this document was intended for the files of a Quarterly or Yearly Meeting to which the Northwest Fork Meeting was subordinate. That would have been the Southern Quarterly and the Philadelphia Yearly Meeting during the years in question. One additional Quaker reference to this family is Kenneth Carroll’s Quakerism on the Eastern Shore.That source lists under the Northwest Fork Monthly Meeting the birth of Ann Willis, daughter of Richard and Britannia and the death of Ann Willis “daughter of Richard.”If this is the same Ann, she died unmarried at age 35. Interestingly, Carroll’s work does not include the other data found in the mislabeled Northwest Fork record. Obviously, he did not have access to that register. In conclusion, it is clear that Richard and Britannia Willis affiliated with the Quakers. Apparently, the Friend’s connection ended with Ann’s death. Possibly she was the motivating factor for the family’s involvement in the sect. John Willis, died 1712, patented a 50-acre tract named Wantage in Dorchester County in 1702. 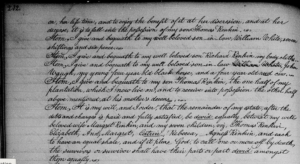 Palmer, Katherine H., transcribed Baptism Record, Old Trinity Protestant Episcopal Church, Church Creek, MD, (Cambridge, MD), 19, baptisms of son Richard’s children Mary (1754), John (1755), Elizabeth (1758) and Richard (1761); son John’s child Jarvis (1758); son Andrew’s children Keziah (1770) and George (1775). Caroline County, MD Land Records, Liber JR-R, Folio 115, 29 Oct 1831 deed for ½ acre from Foster Willis and Wife Ann to trustees of the Methodist Church, proved 31 Jan 1832. Actually, this family were Nicholites, or New Quakers, until that sect reunited with the Quakers in 1798. See Carroll, Kenneth Lane, Joseph Nichols and the Nicholites: A Look at the “New Quakers” of Maryland, Delaware, North and South Carolina (Easton, Maryland: The Easton Publishing Company, 1962), 78, Births of the children of Andrew and Sarah Willis: Andrew, 3 Nov 1774; Mary, 5 Dec 1770; Rhoda, 18 May 1766; Roger, 14 May 1768; and Shadrick, 15 May 1772. Births of children of Thomas and Sina Willis: Anne, 5 Dec 1770; Elic, 1 Feb 1785; Jesse, 15 Feb 1773; Joshua, 15 Dec 1774; Milby, & Aug 1768; Milley, 3 Feb 1784; Thomas, 28 Oct 1776; and William 20 Sep 1771. Ancestry.com, U.S., Quaker Meeting Records, 1681-1935: Births & Deaths, 1790-1828, Wilmington Monthly Meeting, New Castle, Delaware. Birth records are all at p. 19; Burial records at pp. 7, 8, and 10, respectively. Cranor, Henry Downes, Marriage Licenses of Caroline County, Maryland, 1744-1815(Philadelphia: Henry Downes Cranor, 1904), 18. Browne, William Hand, Archives of Maryland v.2, Proceedings and Acts of the General Assembly of Maryland, April 1666 – June 1676(Baltimore: Maryland Historical Society, 1884), 270, Naturalization of John Gootee and Margarett Gootee his wife of Dorchester County and Stephen Besson of Dorchester County all born in the Kingdom of France. Act read as being passed by the Assembly at 19 Apr 1671 closing of the session on the General Assembly, which began 27 Mar 1671 in St. Mary’s County. This record, however, does not include the couple’s two eldest daughters, Rebecca, born 9 Nov 1788, and Dorcas, born between 1790 and 1793. Carroll, Kenneth Lane, Quakerism on the Eastern Shore(Baltimore: The Maryland Historical Society, Garamond/Pridemark Press, 1970) 255, Ann Willis daughter of Richard and Britana [sic] born 19 Apr 1799; 260, Ann Willis daughter of Richard died 22 Sep 1834.